Barack Obama is being inaugurated for a second term on the day the nation has set aside to honor the birthday of Martin Luther King, Jr. Since President Obama is the first person of color to be elected President, this seems appropriate. After all, Dr. King's leadership of the Civil Rights movement helped make this possible. Prior to this time our nation had failed to live up to our potential as a nation that promised freedom to all its people. The only problem was that until the 20th century the recipients were believed to be white males. Time has changed this, but it required persons of courage, such as Dr. King to move us in this direction. Barack Obama is the beneficiary of this movement, but as we have seen these past four years, racism is still with us. Persons like President Obama are seen by many as not truly American, and so we hear people bemoan the loss of traditional America -- that is the America ruled by the White majority. As the most recent election demonstrated, that majority is becoming much smaller. As a result the President won a sizable victory, even though he failed to carry a majority of the white vote. Many fear this change in demographics, but perhaps we should see it as representing the nation's true potential. 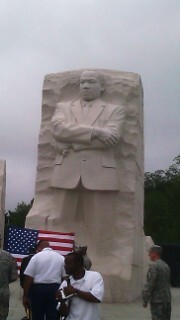 I share a picture of the Martin Luther King Memorial on the Washington Mall, which I visited this past summer. The memorial invites us to consider Dr. King's contribution to helping America become a more just nation. Won't you join me in celebrating the future of our nation on this day of remembrance and inauguration. Barack Obama Freedom Inauguration Day justice Martin Luther King Day Martin Luther King Jr.
Where was George Bush Jr? I heard that he was hanging out with 41. I wonder how proud MLK is today? I think W was with his father. They probably don't have much time together. I was more surprised by the absense of Mitt Romney. I thought the opponent usually attended as a good will gesture, but my memory may be wrong. As I understand it, Michael Dukakis didn't attend either.